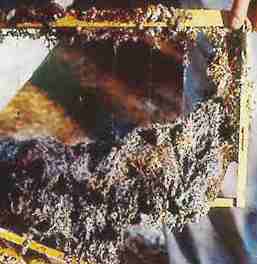 Wax moth are not parasites or predators of bees, but they are a nuisance to beekeepers as they destroy comb that is not cared for, either by the bees or in storage, as the picture below right shows. Both Lesser and Greater Wax Moth will destroy combs that aren't looked after. There are areas of the U.K. where they seem to be little problem. Lesser Wax Moth Achroia grisella (near right) is not much problem in my area. It is said not to attack virgin comb, but it does, although it prefers comb that has had brood in. I have seen super combs that have been stored for some time that have been destroyed. Rotating supers, so what hasn't been on the bees one year are first on the next will adequately deal with it. Greater Wax Moth Galleria mellonella (left) in my experience does far more damage than lesser wax moth. It's larvae are so voracious and numerous that they can wreak massive damage in a short time, especially in warm weather. The lasting damage to hive woodwork is also much more severe than for the lesser species. The debris has an unpleasant smell, cleaning up the damage takes valuable time and the wax itself is lost as a product. The links above left will give you a good idea of how to deal with them, but do not expect to be able to eliminate them entirely, however by observing hygiene and being vigilant you will reduce the damage that they cause to an acceptable level. Those beekeepers who claim that wax moth will kill colonies are probably trying to cover up their own miss-management. Strong, well managed colonies will themselves do most of the work required to limit the pest.